With over 55+ Github stars, 150+ pull requests and 700+ commits from 25 contributors we want to thank our community for their support: reporting bugs, generating ideas as well as submitting pull requests. It wouldn’t be possible without you, our users! With over 100K Ansible Galaxy downloads, ansible-st2 became one of the most popular and discussed production-ready StackStorm deployments. What’s changed? In recent releases there was a lot of ongoing maintenance related to StackStorm version to version differences: nodejs 6 -> 8 version update for st2chatops role, support for new st2 services like st2workflowengine , st2timersengine, st2scheduler, fixes, improvements and more. There are some more user-facing changes in v1.0.0: minimum required Ansible version was bumped to v2.5 that led to some unavoidable syntax changes, – as you may know Ansible v2.4 reached end of its life and officially unsupported. Besides that, the BWC sub-role which installs and configures StackStorm Enterprise offering was renamed to EWC, – don’t forget to update role references in your plays if you’re using Enterprise. If not, – it’s time to Try StackStorm Enterprise with a free 90-day trial. Check out other methods to deploy StackStorm: Puppet, Chef, Docker, Kubernetes / HA, Vagrant / OVA. As usual, you can download it all at Ansible Galaxy: galaxy.ansible.com/StackStorm/stackstorm/ and find source code as Github repository: github.com/stackstorm/ansible-st2. We recommend to pin the role to specific version in your infrastructure to avoid sudden surprises. 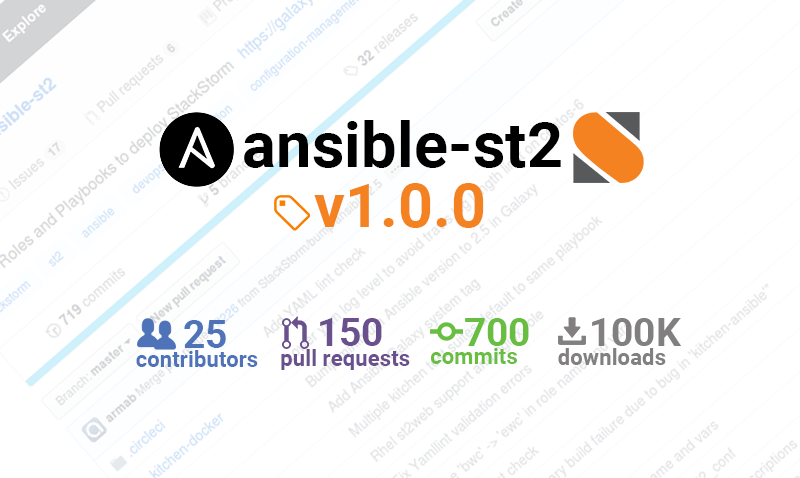 Read more about evolution of ansible-st2 role in Releases Changelog.